Bay is a half-hardy shrub or small tree that can tolerate winter temperatures no lower than -7C (20F). In cold climates, bay is best grown in a container that can be kept indoors in winter. Fertilise bay grown in containers with an organic water soluble fertiliser every three weeks from spring to late summer. Feeding is not generally needed for plants grown outdoors as herb garden specimen plants or hedges. 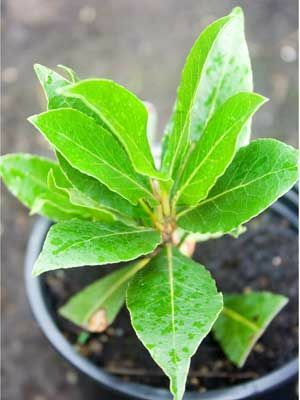 Start with a purchased plant, because bay stem cuttings are very difficult to root. Spring and early summer are the best times to adopt a new bay plant. Outdoors, allow 2m (6ft) between plants being grown as a hedge. When grown in containers, gradually shift plants to a container at least 30cm (12") in diameter. A mature plant, grown in a sunken container, will occupy a space 45cm (18") square. When growing bay as a potted plant, allow the soil to become dry as autumn approaches. Through winter, allow the soil to dry between waterings. Stem or leaves as desired from early summer to autumn. In midsummer, gather perfect small branches and dry them in small bunches. Stored dried leaves in airtight containers.